Have you ever been too tired to pray, or too stressed, or to overwhelmed with what life has dealt you? There have been times when I begin to pray and my mind goes blank. It’s more than a senior moment – I am too young for those. It is not as if there is a cacophony going on in my head reminding me of all the things I have done, need to do and have yet to do. It is just as if my brain is too overworked. Today is one of those days. After a mission trip to England for 15 days, then coming back to turn around in 4 days and fly to a five day conference, lead two workshops and run a vendor booth, then dash home to pack, move and unpack in five days – whew – I am blank. No matter what we go through, once we take Jesus into our hearts as our Lord and Savior, nothing can drive Him out. We can always turn to Him to be our refuge, strength and very help in times of trouble (Psalm 46:1), to give us strength to do all things (Phil 4:13), and as our High Priest in eternity to live to intercede for us (Hebrews 7:24-25). Not only that, but I thoroughly believe God puts it on believer’s hearts to pray for us. I know I have had a name pop into my thoughts from out of nowhere. I have learned to stop and pray for them, knowing in my heart of hearts that God knows their needs. I cannot count the times I have later learned that person needed to be covered in prayer. I bet that has happened to you as well. So if you have a blank day, like mine is today, take heart. 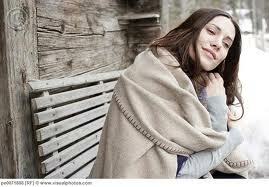 God has already got you covered, like a cozy blanket fresh from the dryer. He knows your every need, situation, possible outcome and stressful moment. Praying does not always have to be with words. Sometimes, it is just knowing you are connected with an unbreakable bond to the Creator of the Universe, your All Powerful and Almighty and loving Father is enough.